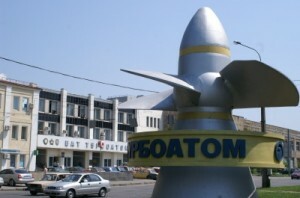 The Kharkov-based factory «Turboatom» developed a technical project of upgrading a high-pressure cylinder and steam admission of turbines K-220-44, which are now in use in nuclear power plants in Ukraine, Russia, Hungary and Finland. The he leading experts in the field of turbine building of Ukraine took part in the development of the project. Among them — the staff of the A.N.Podgorny Institute of Mechanical Engineering of NAS of Ukraine, NTU «Kharkiv Polytechnic Institute», Kharkov National Automobile and Highway University. The cooperation allowed to create the channel of the high-pressure cylinder of the turbine K-220-44, which provides increased capacity and improves other technical characteristics of a turbine as a whole. In carrying out this project the method of optimal design of the flow part was used. It combines technological and scientific development of the manufacturer («Turboatom»), modern design methods and techniques in computational process modeling of turbine flow parts. At this stage, new design solutions have already gone beyond the design department of «Turboatom» and are actively discussed with customers. «We are confident that the new product offered today will be in demand by the customers and will soon move from the design stage to the stage of production in the workshops of the plant,» — said the chief designer of steam and gas turbines Viktor Shvetsov. The idea of this project was generated by «Turboatom», were then computational studies and the preliminary design were performed, and the ultimate engineering solution was suggested.